It is amongst Africa's larger countries and yet has one of the lowest population densities in the world - so its wide-open spaces provide world-weary travellers with a wonderful sense of precious freedom, far removed from mass tourism. Namibia boasts some breathtaking sights. The Fish River Canyon, in the central region, is second only to the Grand Canyon in terms of size and grandeur. Within this region are the Ai-Ais hot springs, surrounded by lovely scenery and abundant birdlife. En route towards Windhoek is the Hardap Dam Recreational Resort, excellent for fishing. To the north, covering 5,000 sq. km., are the silvery-white salt plains of the Etosha Pan- a place of shimmering mirages and wind-whipped plumes of sand known as "dust devils." The Pan is at the heart of the 22,270 sq. km Etosha National Park, home to the largest concentration of wild animals in Namibia. There are 144 mammal species alone, lion, cheetah, leopard, elephant, wildebeest, black rhino, hyena, jackal and several species of wild cat amongst them. Various types of antelope, including the rapier-horned gemsbok and the tiny Damara dik dik, may be seen gathered around a waterhole, alongside giraffe and zebra. Bird-life is prolific. Along the aptly-named Skeleton Coast, the rusting hulks of ships, preserved in the clean, dry atmosphere, are eerie witnesses to the treacherous fogs that brew up along the coastline. At Soussusvlei, in the Namib-Naukluft Park, the 300 metre tall sand dunes are the highest in the world. The Sesriem Canyon is another dramatic feature. Wildlife thrives despite the harsh environment. In the rainy season, pools attract many birds and animals while even during the dry period, oryx, springbok and ostriches can be seen feeding off the sparse vegetation. To the north of the country, the lush Caprivi Game Reserve is elephant country as well as home to large herds of buffalo, lion, leopard, cheetah and hyena. Access is limited to the other parks in this region, Kaudom and Mahango. Part of the floodplain of the Okavango Delta, the latter supports prolific game, including crocodile, hippo, elephant, buffalo, shy sitatunga antelope and numerous bird species. 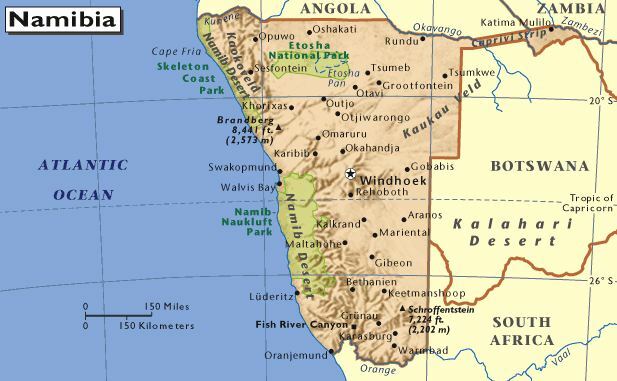 Namibia's principal seaside resort is Swakopmund. It looks like a Bavarian village, a reflection of its German colonial past. Close to the charming, coastal town of Lüderitz is the ghost town of Kolmanskop, abandoned when an early 20th century diamond rush petered out, leaving the grand old buildings to gradually crumble into the desert. German influences are found in the architecture of Windhoek - Namibia's capital - in particular in the historic seat of government, the Tintenpalast ("Palace of Ink"), the Christuskirche, and the white-walled Alte Feste, once a fort and now a museum. Namibia is home to several African ethnic groups, each with their own distinct customs and style of dress. Year-round sunshine makes Namibia a great destination for open-air sports and activities. Among the more unusual pursuits are dune-skiing and camel safaris. For the adventurous there's the chance to try white-water rafting, canoeing, gliding and skydiving, while for climbers, hikers, horse-riders and mountain-bikers there are a number of rewarding trails. Deep sea and fresh water fishing, diving and snorkeling are options. Golfers have a chance to play - one course has fairways of desert sand! What better way to start the day than a dawn hot-air balloon safari over the Namib followed by a champagne breakfast in the desert. For flora enthusiasts, Namibia boasts some intriguing oddities. The so-called fossil plant, Welwitschia mirabilis, a hummock of twisted, leathery leaves, not only survives in the arid wastes of the desert but also lives to a great age - one example is believed to be 1,500 years old. Spiky "hands" grow from the "arms" of the quiver tree, found in the Kokerboom Forest, while the branches of the baobab trees look more like its roots. The unit of currency is the Namibia Dollar, which is divided into 100 Cents and is pegged on the South African Rand. The notes are issued in Namibia Dollar denominations of 10, 50, 100 and 200. International Credit Cards (i.e. Visa, Mastercard, Diners Club and American Express) are widely accepted. Travellers cheques in Pound Sterling, German Marks, United States Dollars and South African Rand are easy to exchange at Banks, but Rand Travellers Cheques are highly recommended when paying locally for accommodation. A Yellow Fever Certificate is required but only if arriving from infected areas. Immunization is however recommended against hepatitis A, polio, tetanus and typhoid. Malaria exists in the northern regions from November - May / June and along the Kavango & Kunene Rivers throughout the year. There is also a risk of rabies. Namibia has a well-developed transport and tourism infrastructure, with more kilometres of road per head of population than anywhere in the world. Cars and four-wheel-drive vehicles are available for rental. 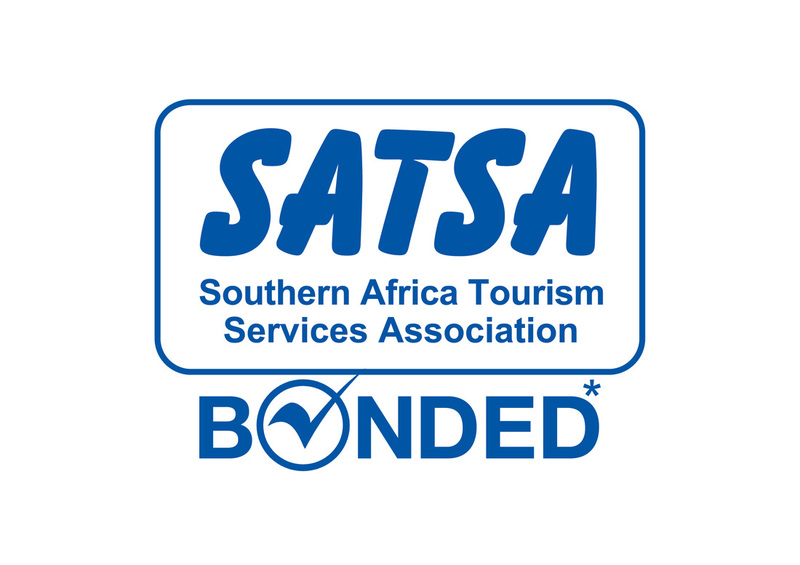 Scheduled bus services link the major centres as well as destinations in South Africa. Train services include luxury excursions visiting major tourist attractions both within the country and to Victoria Falls. The range varies from exclusive lodges and luxury hotels to guest farms, pensions and rest camps. Best time to visit: June to October, but March to May is also great! If you like it hot, then November to February is for you.